The German Historical Museum (German: Deutsches Historisches Museum), known by the acronym DHM, is a museum in Berlin, Germany devoted to German history. It describes itself as a place of "enlightenment and understanding of the shared history of Germans and Europeans". It is often viewed as one of the most important museums in Berlin and is one of the most frequented. The museum is located in the Zeughaus (armoury) on the Unter den Linden as well as in the adjacent Exhibition Hall designed by I. M. Pei. The museum was founded on 28 October 1987, on the occasion of the 750th anniversary of the founding of Berlin; it was inaugurated in the Reichstag building in former West Berlin. After the success of an exhibition on Prussia, which was shown in the Martin-Gropius-Bau in 1981, the then Governing Mayor of (West) Berlin, Richard von Weizsäcker, commissioned four prominent historians – Hartmut Boockmann, Eberhard Jäckel, Hagen Schulze and Michael Stürmer – to prepare a memorandum, which appeared in January 1982 under the title Deutsches Historisches Museum in Berlin. The project enjoyed great support from Federal Chancellor Helmut Kohl, who termed the founding of a German historical museum in Berlin a national priority of European importance in his speech on the State of the Nation before the German Bundestag on 27 February 1985. A commission consisting of 16 leading historians, art historians and museum directors worked out a concept for the museum in 1985/86 and put it up for discussion in public hearings in 1986. The final version became the basis for the founding of the DHM. The core of the Museum's brief was to present German history in an international context. Multi-perspective perceptions aimed to encourage an understanding of the viewpoint of others in order to allow for a high level of reflection on history and culture in a time of the internationalisation of everyday life and the globalisation of work and commerce. 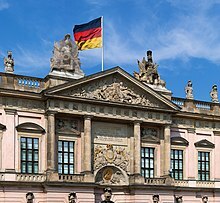 On 28 July 1987, the partnership agreement was signed between the Federal Republic of Germany and the land of (West) Berlin concerning the establishment of the temporary trusteeship of the German Historical Museum as a private limited company. Originally the Museum was to be located near the Reichstag Building at the Spreebogen, the government complex at the bend of the River Spree. The architecture competition for the project was won by the Italian architect Aldo Rossi in 1988. However, in 1989 the fall of the Berlin Wall led to a change of plans: on the day of reunification 3 October 1990, the Federal Government transferred the collection and premises of the former Museum für Deutsche Geschichte (Museum for German History) to the DHM; the last government of the GDR had already dissolved that museum in September 1990 and made its property and contents available to the DHM. And thus the Zeughaus of 1695 – the oldest building on Unter den Linden – became the seat of the German Historical Museum. The first exhibitions were shown in the Zeughaus in September 1991. The façade of the Zeughaus was restored between 1994 and 1998 on the basis of historical documents. The building was closed from 1998 until 2003 while extensive restoration measures were carried out by the architectural office of Winfried Brenne. In the course of the construction of the new adjacent museum hall by Ieoh Ming Pei between 1998 and 2003, glass roofing was once more installed above the Schlüterhof, the inner courtyard with the masks by Andreas Schlüter. The new building by I. M. Pei with a surface area of 2,700 m2 (29,000 sq ft) on four floors, and structurally engineered by Leslie E. Robertson Associates, was opened for temporary exhibitions in 2003. The Permanent Exhibition German History in Images and Artefacts was inaugurated in the Zeughaus by Federal Chancellor Angela Merkel on 2 June 2006. As of 30 December 2008 the DHM assumed the legal form of a Public Law Foundation of the Federal Government (Stiftung öffentlichen Rechts des Bundes). Founded in 2009 to establish a centre for the remembrance and documentation of flight and expulsion, the Stiftung Flucht, Vertreibung, Versöhnung (Foundation Flight, Expulsion, Reconciliation) is under the aegis of the German Historical Museum. The permanent exhibition German History in Images and Artefacts is housed in the Zeughaus on a surface area of 8,000 square meters. The four floors of the I. M. Pei Exhibition Hall are devoted to the Museum's temporary exhibitions. The specialised research library on German and general history as well as museum work contains more than 225,000 volumes, including 13,000 rare books, 40,000 volumes of magazines and newspapers, 5,000 volumes of militaria and 15,000 museum catalogues. The public reference library is located behind the Zeughaus in the Museum's administrative building, which had belonged to the Prussian credit union Prussische Central-Genossenschaftskasse from 1899 to 1945 and later to the GDR state-run company Minol. The Zeughauskino, a movie theatre seating 165 guests, is an integral part of the German Historical Museum and is located in the Zeughaus. Its main aim is to bring together historical and film-historical questions in a programme that is marked by film series to accompany exhibitions as well as thematic retrospectives. Artistic posters 1896–1938 from the Hans Sachs Collection, political posters 1920–1960 from the Wolf Collection, and GDR posters: c. 80,000 objects. In 2012, following a court decision, the heirs of Hans Sachs were granted possession of his collection which had been expropriated from Dr. Sachs by the Nazis in 1938. The German Historical Museum has the most extensive object database of all museums in Germany that can be consulted on the Internet. The collections of the Museum are recorded and administered in the database. It currently comprises around 500,000 objects and provides digital photos of some 70 percent of these objects. Reproduction rights for commercial purposes are managed by the DHM picture archive, which charges industry-standard usage fees. In cooperation with the Haus der Geschichte der Bundesrepublik Deutschland in Bonn the German Historical Museum operates a wide-ranging Internet service called LeMO (Lebendiges virtuelles Museum Online, or Living virtual Museum Online), with information on German history from 1871 to the present. More than 30,000 HTML pages, 165,000 pictures as well as audio and video clips are available on the Web. ^ Deutsches Historisches Museum. Ideen – Kontroversen – Perspektiven. Hrsg. Christoph Stölzl. Frankfurt/Berlin 1988, p.641. Jürgen Kocka: Ein chronologischer Bandwurm. Die Dauerausstellung des Deutschen Historischen Museums. In: Geschichte und Gesellschaft 32/2006, pp. 398–411. Ulrike Kretzschmar (Hrsg. ): Das Berliner Zeughaus. Vom Waffenarsenal zum Deutschen Historischen Museum. The Berlin Armoury. From the Arsenal to the German Historical Museum. München/Berlin/London/ New York, Prestel Verlag 2006. 112 S., zahlr. farb. Abb. ISBN 3-7913-3356-9. Wikimedia Commons has media related to Deutsches Historisches Museum.